Hurtling into the Century of Epidemics? 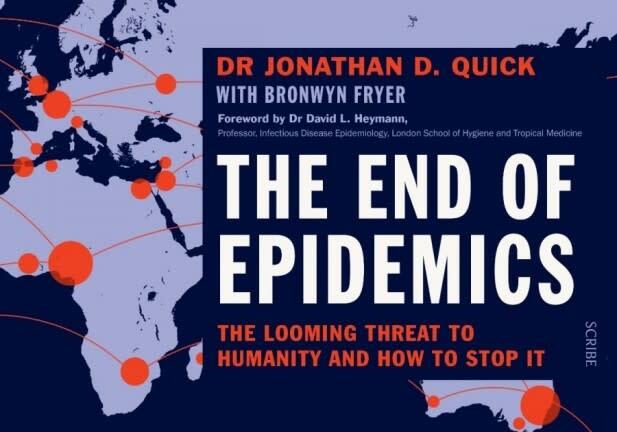 Come along to the launch of the book The End of Epidemics: The Looming Threat to Humanity and How to Stop It by Dr Jonathan D Quick. In The End of Epidemics, Dr Quick tells the stories of the heroes, past and present, who've succeeded in their fights to stop the spread of illness and death. He explains the science and the politics of combating epidemics, providing a detailed seven-part plan showing exactly how world leaders, health professionals, the business community, media, and ordinary citizens can work together to prevent epidemics, saving millions of lives. Come and join us for a drink and hear from Dr Quick, and panellists Professor Jodie McVernon from Doherty Institute, Professor Barbara McPake from Nossal Institute for Global Health and Dr Ben Coghlan from Burnet Institute. Free to attend, but registration is required, To secure your place, please register via the Book Now button. Books are available for sale at the event. Credit card payments only.